Rockin' it Out: Heading East for Easter: Budapest - Sights in "Buda-"
Heading East for Easter: Budapest - Sights in "Buda-"
Marisa and I took a pleasant overnight train from Krakow to Budapest, Hungary for the second stop on our trip. I honestly didn't know much about Budapest, as far as what to see and do, but I'd heard lots of people raving about the place at school. Of course we were packing Rick Steve's but it's sometimes nice to visit a place with no expectations beforehand. Budapest has a long history and is sort of the historical boundary between the East and West, as far as Europe's concerned. The Danube river cuts right through the city, dividing it geographically into the western-side ("Buda") where the Alps end with the Buda Hills and the "Pest" side which is made up of the Great Hungarian Plain which extends into Asia. The history in a nutshell is that the Roman province of Pannonia once stood on the Buda side until the Roman Empire fell, which led Europe into the Dark Ages. During this time there were all kinds of dodgy characters running around, including but not limited to: the Celts, Vandals, Huns, and Avars. Around 896 AD, seven Magyar (MUD-jar) tribes cruised into town and decided to set up shop there and make raids throughout Europe. They settled in the middle of the Slavic people and made out pretty good until they lost a key Battle of Augsburg in 955 against the Germans and Czechs. At that point the Hungarian king Geza adopted Christianity and convinced his nomadic people to settle into this area and start thinking long-term. The Chain Bridge crosses the Danube, connecting the "Pest" side (shown) with the "Buda" side. Legends say that the Magyar tribes were led to this spot by a mythical Turul bird. The bird dropped a sword down in the Carpathian Basin to let them know that this is where they'd be throwing down. We happened across an impromptu changing-of-the-guard outside of the Royal Palace. The former Ministry of War, complete with tons of bullet holes from WWII and from the 1956 Uprising. 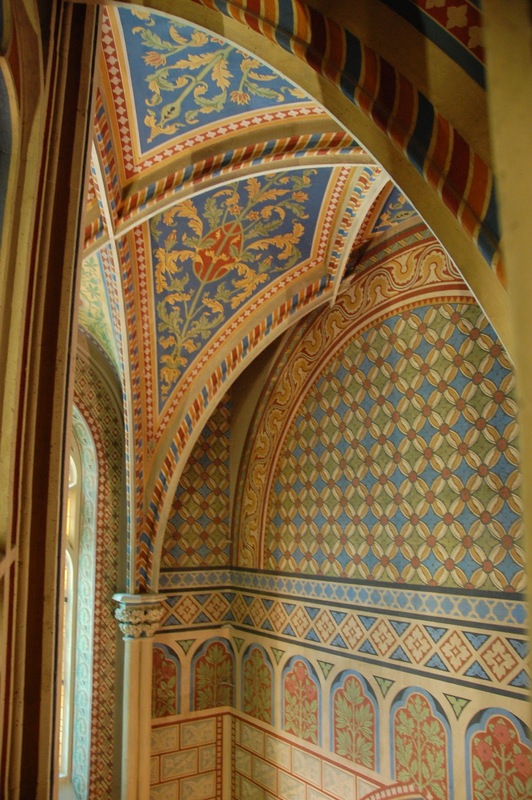 View of Matthias Church, named after a famous Hungarian king from the 15th century. We really liked the mosaic tile-work found on the ceilings on many buildings, such as the Matthias Church. Although the interior was under heavy renovation, we did get to catch a glimpse of some of the hand-painted walls and ceilings. View of the Fishermen's Bastion with St. Istvan (Stephen), Hungary's first Christian king (967-1038). He was baptized by his father, King Geza, and ruthlessly Christianized the nation, beheading those that would not convert. For that he was credited with keeping Hungary on the map and was sainted after his death. So that get's us started with Budapest, but the best is yet to come with the sites from the "Pest" side coming up as well as our visit to a Soviet statue park.